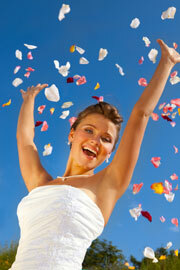 A Mobydisc Wedding DJ gives you a great reception! From the moment you book a Mobydisc wedding DJ you know our 30 years experience will make an unforgettable difference to your reception. Your expert Mobydisc wedding DJ arrives early, sets up on time, is formally dressed and will be the life of the dance floor. Special requests, special effect dance lighting, your choice of songs and a mike for speeches all come with your Mobydisc wedding dj reception package. Your Mobydisc wedding DJ will even act as MC if required. And you can book a cordless mike if the reception room is large or the speeches not located close to the dance floor. Because you have chosen the music with our online song selector you know the reception will sound as good as the bridal party look. And you can always bring your favourite songs on your iPod, iPad, smart device or laptop, that you want your Mobydisc wedding DJ to play. Certain important moments at a wedding reception require special music. There's the official entry of the bridal party, cutting of the cake, the bridal waltz and the farewell circle. Mobydisc understands the significance of these important moments. 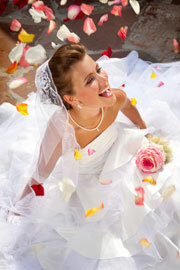 Your wedding DJ knows exactly what to play and when to capture the moment and ensure it stays in your memory forever. The sound systems at reception venues can be unreliable or poor quality. The microphone provided by the Mobydisc wedding DJ plugs into our state-of-the-art music system and the cordless mike can be requested where a regular mike cord may not reach the official table. Do you already have an MC? They will sound better through our system. And your Mobydisc wedding DJ is trained to act as MC for no extra charge if you prefer. Want To Add Your Own Music? No problem. You can bring your own iPod, iPad, smart device or laptop. Just let us know at the time of booking if you wish to do this. From the moment you book the Mobydisc wedding dj your details are recorded, confirmation sent and the booking computer tracked. And our operators are just a phonecall away 24 hours a day - there is always someone to talk to in the rare event that a back-up DJ or system is required. We supply DJs for wedding receptions too!